Goodreads|You can find Ann Hite on Facebook! Goodreads Summary: Shelly Parker never much liked Faith Dobbins, the uppity way that girl bossed her around. But they had more in common than she knew. Shelly tried to ignore the haints that warned her Faith’s tyrannical father, Pastor Dobbins, was a devil in disguise. But when Faith started acting strange, Shelly couldn’t avoid the past—not anymore. Critically acclaimed, award-winning author Ann Hite beckons readers back to the Depression-era South, from the saltwater marshes of Georgia’s coast to the whispering winds of North Carolina’s mystical Black Mountain, in a mesmerizing gothic tale about the dark family secrets that come back to haunt us. 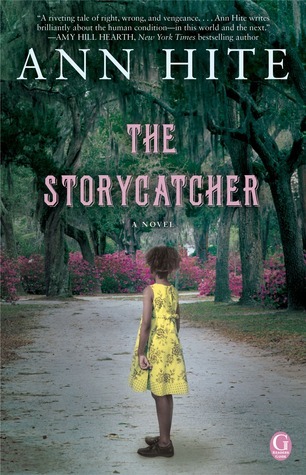 It took me a while to get into The Storycatcher, and at first I didn’t like it, but once I got past the first 75 or 80 pages, I really started to enjoy it. I think part of why I didn’t initially like The Storycatcher was because of the set-up. The Storycatcher has several narrators, and there’s a bit of set-up needed in order to understand the rest of the story. It did start a little slow for me. You certainly see an assortment of characters, several of whom narrate the book. I can’t imagine this book being told by one narrator, because they all have their own story and their own part in the events of the book. But at the same time, it didn’t quite work for me. It flowed pretty well, and I think it is the best way to tell the story, but there’s something about it that didn’t quite work for me. I’m not sure why, but there’s just something about it that wasn’t quite there. It also went back and forth between the 1930’s and the 1800’s, so I had to pay attention to not only the narrator, but the time period, and it always took a couple paragraphs to get into each part of it. I am really intrigued by the combination of historical fiction and paranormal. I was expecting something more paranormal than what we saw in the book, especially because the setting and period in time is such a good one for a paranormal historical fiction. I loved the vibe of the book, which was sort of gothic and creepy and there’s a sense of isolation on the mountain that worked really well. I also really liked the mystery aspect of the book, and you start unraveling what’s going on with Pastor Dobbins and what really happened during the storm several years earlier and secrets start coming out. You’re not quite sure what’s going on. When some of the mysteries were revealed, I totally felt like I should have picked up on them, because some weren’t that surprising. But they kind of were, because I sort of wasn’t expecting it. There is something about this book that puts you on edge and makes you feel uneasy- it’s not outright scary, but Pastor Dobbins is a very creepy character. The Storycatcher was a little hard to get into a first, and for me, it took a little too long to set up the story. The multiple narrators worked well enough, but it was also hard to keep up with at first. Still, The Storycatcher was a great read once I got into it. The Storycatcher gets 4 stars.